BRIDGETOWN, Barbados, CMC – Tagenarine Chanderpaul hit a half-century to put the grind on a listless Barbados Pride attack to tighten the grip of newly-crowned champions Guyana Jaguars on their Regional 4-Day Championship match yesterday here. 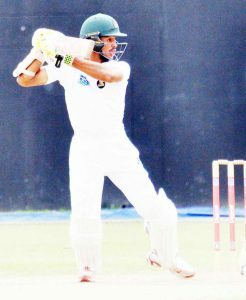 The left-handed opener was unbeaten on 66, as Jaguars reached 154 for four in their second innings, when bad light stopped play 20 minutes past the scheduled close on the third day of their ninth-round match at Kensington Oval, for an overall lead of 252. Chanderpaul, whose 197-ball innings in just under five hours includes a mere five boundaries, shared solid stands of 44 with fellow left-handed opener Chanderpaul Hemraj for the first wicket and 73 with Vishaul Singh for the third wicket. West Indies Under-19 World Cup winner Chemar Holder has been the most successful Pride bowler with 3-56 from 18 overs. This followed West Indies fast bowler Kemar Roach hitting the top score of 51, as the Pride surrendered a first innings lead of 98, when they were bowled out for 199 in their first innings. He shared a rearguard of 52 for the eighth wicket with Jomel Warrican that offered Pride hope of reach the 200-run mark and earning a batting point, but they fell agonisingly short. Romario Shepherd was the pick of the Jaguars bowlers, grabbing 5-40 from 14 overs, and Keemo Paul snapped up 2-41 from 15.5 overs. Chanderpaul and Hemraj carried the Jaguars to lunch on 41 for no wicket with little fuss before Holder made the breakthrough for the Pride in the third over after the interval, when he had the latter caught at deep mid-wicket for 21. Jaguars captain Leon Johnson spent 40 minutes at the crease before he was caught at point off Holder for six to leave the Jaguars 64 for two. Singh came to the crease and with Chanderpaul continued to wear down the Pride bowlers for the next two hours either side of tea with defiant batting, also enduring a couple of stoppages for light showers. They carried Pride to 105 for two at tea and continued merrily after the break to bat the Jaguars into an impregnable position. Pride captain Shamarh Brooks employed the slow bowling duo of left-arm spinner Jomel Warrican and Roston Chase after the break for more than an hour and it yielded moderate success only. Warrican had Singh stumped for 43, when the left-hander charged down the pitch and was deceived with the flight of delivery. Next over, Holder got veteran and former West Indies captain Shivnarine Chanderpaul, Tagenarine’s dad, to edge a loose drive and caught behind for a seven-ball duck to leave Jaguars 138 for four. Bramble joined the younger Chanderpaul and they batted for close to an hour through to the close, but not without incident. The Jaguars wicketkeeper/batsman appeared to have been dropped by Dowrich behind the stumps first ball off Holder and then had to seek medical attention when he struck on the helmet by West Indies fast bowler Miguel Cummins. Earlier, Pride, starting the day on 147 for seven, were bowled out in just over an hour, after play began half-hour earlier than regularly scheduled due to weather interruptions on the previous two days. Roach, who pulled up lame bowling on the previous day, batted for 99 minutes, faced 59 balls and struck nine fours. Before he reached his landmark, Warrican was caught at gully for 22 to become Shepherd’s fifth wicket, and soon after he reached his 50, Roach was caught behind off left-arm spinner Veerasammy Permaul cutting at a wide ball. Keemo Paul brought the innings to a close, when he bowled Holder for five. Jaguars entered the match with an unassailable 135 points, but have so far gained two batting points, three bowling points and 1.8 pace bowling points. Pride have gained three bowling points, no batting points and 2.6 pace bowling points to add to their season total of 85.8. Scores: GUYANA JAGUARS 297 (Chanderpaul Hemraj 90, Leon Johnson 56, Raymon Reifer 33, Sherfane Rutherford 32, Shivnarine Chanderpaul 30; Chemar Holder 17.5-2-57-5, Kemar Roach 3-31) and 154 for four (Tagenarine Chanderpaul 66 not out, Vishaul Singh 43, Chanderpaul Hemraj 21; Chemar Holder 3-56). BARBADOS PRIDE 199 (Kemar Roach 51, Shamarh Brooks 25, Shayne Moseley 24, Jomel Warrican 22, Jonathan Carter 21; Romario Shepherd 14-4-40-5, Keemo Paul 2-41).